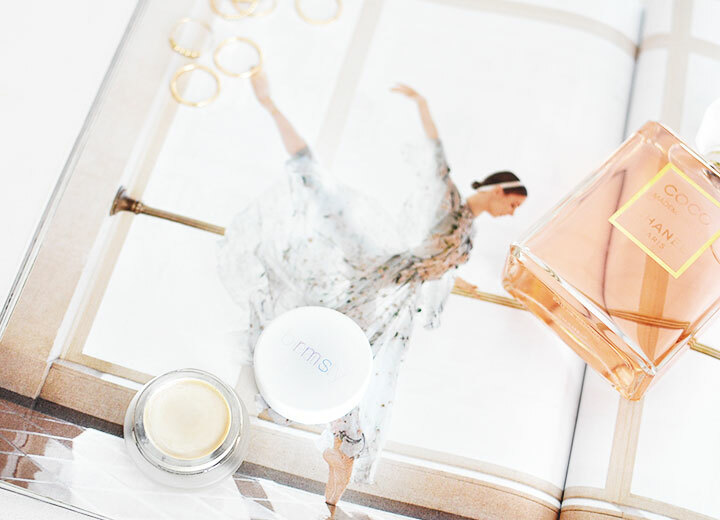 IF THERE IS ONE BEAUTY PRODUCT I NEVER LEAVE THE HOUSE APPLYING IT'S THE RMS BEAUTY "LIVING LUMINIZER!" THIS LUMINIZER WAS A GAME CHANGER FOR ME FOR MANY REASONS. THE #1 REASON IS. . . IT'S ORGANIC! #2. . . IT'S LIGHT & WILL GIVE YOU A BRIGHTER, YOUTHFUL & FRESHER GLOW. MY FACE TENDS TO BUILD UP OIL THROUGHOUT THE DAY, SO I CHANGED TO THE CHANEL AQUALUMIERE FOUNDATION (WHICH IS A BIT ON THE MATTE SIDE) SO I ADD THE LUMINIZER ON THE AREAS I WANT A BIT OF SHINE SO MY FACE DOESN'T LOOK TOO FLAT & DRY. SO, IF YOU WANT TO CONTROL YOUR SHINE, I WOULD RECOMMEND A MATTE FOUNDATION AND THIS LUMINIZER. Such a lovely photo! Thanks for the inspiration!